The Place Located at Suntec City Mall, Fat Chap is a brand new dining concept by the 1855 group, which also manages restaurants like Wakanui and The Spot at Marina One. The restaurant is located at the east wing of Suntec City Mall, near to Promenade MRT station. The dining space is casual and relatively open, with a focus on Asian dishes. There is a live charcoal grill station near the entrance where you can watch the chefs in action. Otherwise, the indoor space is also quite ideal for private events due to the flexibility of partitioning the space. The Food A quick glance at the menu, and it is not hard to notice the apparent Indonesian influence on its dishes. No prizes for guessing where Fat Chap’s head chef hails from. Some of the dishes are also inspired by chef’s childhood memories, with a tribute to Asian street food as well. That said, there are other Asian dishes like Iberico Pork Cheek, Asian Buffalo Drumlets and Indian Omelette. Food aside, there is also a good selection of cocktails from the bar. For a start, the Pulled Chicken (S$12) is a good take on a Szechuan inspired dish for me. The tender chicken here is tossed with Szechuan dressing, peanut and bean sprout. I like this dish. Moving on to snacks, I tried were the Crispy Chicken Skin (S$8) and Crispy Pig’s Ear (S$12). The former is very good. The chicken skin is very crunchy, and it’s served with an addictive sweet plum chilli sauce. I’m not a fan of pig ears so it is definitely the chicken skin for me. From the weekend brunch menu, I also had the “Bakmie” Goreng (S$15), served with prawn and squid, acar and topped with sunny side up egg. This is quite a unique brunch dish and a refreshing twist to the usual cafe fares. It is served with a sambal sauce, but be warned that it is very spicy! Another dish which I enjoyed is the Oxtail Soup (S$20), prepared from chef’s grandmother recipe. Served with white rice, the soup is rich in flavour along with potato and carrots. From the robatayaki section, the Eggplant (S$8) has the right spice level although it looks spicy. Topped with okra, scallion, garlic and chilli, the combination works well and it is a dish I don’t mind having again. For the sharing platter, I tried the Fisherman’s Catch (S$118), good to share for 3 to 4 people. 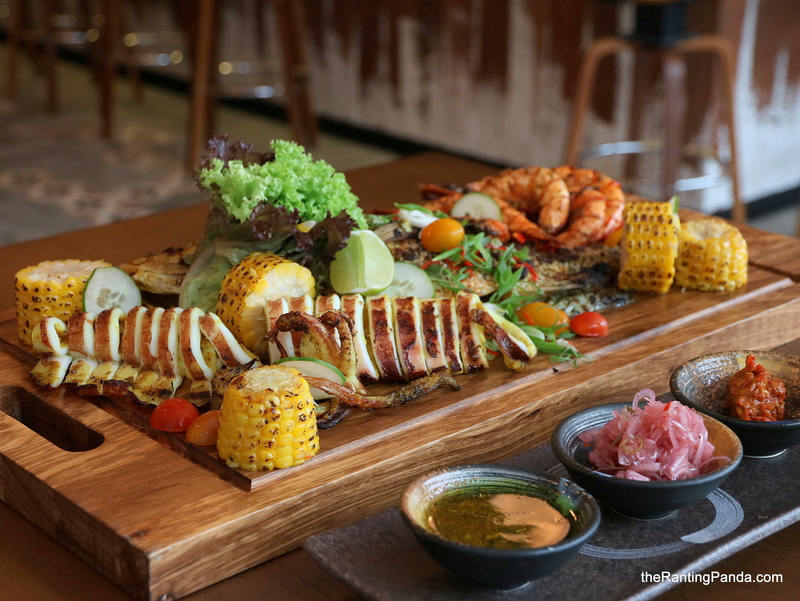 There are grilled corn, vegetables, prawns, squid and a whole marinated fish. This platter does not stand out much for me other that it’s gigantic size, as I find that each ingredient here is not that outstanding as compared to the other dishes I tried. For desserts, expect the likes of Asian elements like Klapertart (S$12) and Thai Milk Tea Pudding (S$12). The former has coconut custard, almond falkes and run and raisins ice cream, while the latter is a good pudding version of the classic Thai drink with elements of azuki bean and lychee. Rants Fat Chap literally translates to 肥仔 in Cantonese, which may seem like a disjoint between its name and the dishes on the menu. It is hard to tell what type of cuisine the restaurant is serving just by its name. Will I Return Again? It’s interesting to see the modern twist in Asian dishes at Fat Chap. While some of the dishes are slightly spicy, it is worth a try if you are looking for a dining place in the Suntec vicinity. Make your reservation instantly at Fat Chap here.